Islamophobia is on the rise in Scotland. That is troubling enough. But what’s even more concerning is that many of those whom I would define as Islamophobic feel very good about it. They see themselves not as racist or xenophobic, but as defenders of democracy and human rights against the adherents of a religion they believe is incompatible with both. Over the past few years the advance of Islamophobia can be easily observed. Anti-Muslim newspapers such as Daily Star have expanded and become more aggressive, cherry-picking reports of crimes by perpetrators from Islamic countries in order to confirm their prejudices; Facebook pages with a clear anti-Muslim agenda – such as that of Anti-Islam Alliance – had hundreds of thousands of shares, including claims that Muslim immigrants are “dumbing down” United Kingdom; parties such as UKIP, which hysterically warn of an “Islamic totalitarian idealogy”, have been founded. To be sure, Islamophobia is no British speciality. In fact, Islamophobia is on the rise across western Europe, not least in the UK. In France, for example, similar developments started years earlier. France is home to around 5 million Muslims, who disproportionately live in poverty and unemployment, often in ghettoised banlieues. This incident should rightfully horrify, but it will now undoubtedly fuel an already ascendant far-right. Of course, Islamophobia can’t be laughed away and ours is just small way of dealing with it. But what’s clear is that traditional racist arguments are now more likely to come in the form of abuse on the basis of religion. The argument is often that Jews share the same values as Christians, and Chinese immigrants are good at integrating, but for Muslims neither is true; plus, they want to take over. Which is why their religion is in fact an ideology; which is why it is OK to be against it; which in turn makes you a freedom fighter. The consequences? More anti-Muslim hatred, more disillusionment among already marginalised young Muslims, more potential recruits for extremist groups. But that’s not all. There is fear of losing out economically, for which Muslims are scapegoated; there’s the challenge of living in a society changing rapidly in the light of globalisation; there’s anger about the increasing visibility of immigrants. Rise of Islamophobia also linked to corporate media’s bias. During the Scottish referendum campaign, we have already seen the corporate media playing along to the Westminster parties, to build and promote a fear among the Scottish population based on lies. Most media outlets fail to mention facts such as Muslims in the UK give more to charity than other religious groups. Yet monitoring groups and campaigners point out that hate crime is often under-reported, with Muslims in particular reluctant to contact the police for fear they won’t be taken seriously. Some campaigners point out confidence in the police may also be low in the wake of counter-terrorism strategies such as Prevent. And they say harrasment that is not violent, such as verbal abuse or spitting, can still spread fear and make communities feel under siege. There is an alternative way, of course. In Norway, the country’s left had opened the country’s doors to Muslims and diluted its Christian heritage. But Norway’s response was not retribution, revenge, clampdowns. “Our response is more democracy, more openness, and more humanity,” declared the prime minister Jens Stoltenberg. Norway’s enlightened response could be a model elsewhere in Europe too. It would be the last thing the attackers would want us to do. That, in itself, should give us all pause to think. There is no such thing as “Islamophobia”, in Scotland, or anywhere else. The notion is an unfounded, baseless form of propaganda used by apologists for Islamism (and Islamists) to try to sideline and silence anyone with the temerity to criticise anything associated with Islam. Islamism, and the more conservative aspects of Islam, with its attitudes and practices towards women and homosexuals, are indeed incompatible with those things. – including claims that Muslim immigrants are “dumbing down” THE United Kingdom. The idealogy of Islamism, with its attitudes towards women, homosexuals and, well, anyone who isn’t a Muslim, are pretty totalitarian. Yes, the French pretty much feel that France is for the French. I can never understand why people want to go there, even on holiday. They’re not the friendliest bunch. Yes, in all sorts of unexpected places (see comments on Sweden below). Wow, that’s quite a persecution complex. I can see why you’re happy living in Scotland. Those poor dears, enjoying the benefits of living in an advanced western liberal democracy (and not a developing country). Maybe where you live. No problem in my neighbourhood, which all things being relative is pretty diverse. What’s wrong with everyone where you live that they can’t behave and get along? Any evidence for that assertion? Which charities, doing what charitable work? Animal lovers give more money to animal related charities. Who knew? Which ‘communities’? There is of course no such thing as the ‘Muslim Community’ (in the same way there is no ‘Indian Community’ or ‘Asian Community’). “There is an alternative way, of course. In Norway”. Who got 13% of the votes and 49 of 349 (14%) of seats in the 2014 elections, and became the third largest party. They are predicted to get 20% of the vote next time. And all in the nordic utopia of egalitarian open social democratic Sweden. Must be down to their “Islamophobia”. Ah, yes. For some reason I could never get into “The Mighty Boosh”, though I’m prepared to concede that it was as excellent as some people said it was. How are things in Manchester, btw? The rise of Islamophobia is directly due to the fact that many people have unthinkingly accepted the lies promulgated by politicians, the mainstream media and the police about supposed Islamic jihadist terrorism – starting with September 11 and including London, Bali, Mumbai, Madrid through to the Charlie Hebdo event in Paris. There are serious flaws in the official accounts of all these incidents, sufficient to discredit them. Exposing the lies and cover-ups is the key to tackling Islamophobia. So it’s all a myth then? Islamism/Jihadism/Wahabbism/Salafism has murdered hundreds of thousands in atrocities. This is political Islam. It is full of hatred and intolerance, it is extremely misogynistic and homophobic. If you want to dispute this type in Al Shabab, Boko Haram. Islamic State and the other myriad of extremist groups who claim to represent Islam. A phobia is an irrational fear of something, there is nothing irrational about having a fear of being shot in Tunisia, Turkey or Egypt. It is happening and we should stop being in denial. No more than our own Governments have in the name of democracy and Imperialism. Our Governments are political Christian yet they still behave in the same manner as any Islamic extremist Government. So its clear there is no distinct link between bad Government and religion. Our Governments have no problems or conscience indulging in terror despotism radicalisation and propaganda at all. I don’t see how anybody can claim that the UK of GB is any better run or operated than any of the worst Islamic states. I doubt any Islamic state would tolerate Government sanctioned paedophilia for one thing. What specific examples can you provide of Islamophobia increasing in Scotland? Your examples, the Daily Star, and UKIP, are British examples. Plus people voted UKIP for a whole lot of reasons. In England the immigrants objected to were mainly east Europeans. The biggest UKIP vote in Scotland as a % of the votes cast in the May election was actualy in Orkney, (4%) are you trying to make out this was Islamophobic? It’s true that many Muslims are well integrated in Norway, I visit the country regularly and I have seen this for myself. But these are asylum seekers that Norway agreed to take in and introduced to Norway. They had to take Norwegian language and culture courses. Legal immigrants. But there are growing numbers of illegals (most of them Muslims) who are not being integrated and ghettoes are forming in parts of Oslo which are no-go areas for white women and Norwegian tolerance is wearing thin concerning these illegal immigrants. Well there are many examples of Islamophobia online on any blog on the subject of Islam. Wait til this blog really heats up and you’ll see some fine examples of it yourself. The whole of the UK is not integrated. We are a disunion with different ideals and distinct cultures. I have no more in common with any little Englander Jockaphobe Daily Mail Daily Telegraph reader than I have with those who deny Islamophobia. People who live in Scotland have identical rights. In Scotland Muslim’s are as Scottish as anyone else. A persons religion is their own affair but that person’s rights are the business of us all . Putting a person into a group based on their religion is wrong. We shouldn’t fall in to that trap which is laid by elite’s, encouraged by the traditional media, politicians and the like. It does worry me though that people are being singled out. This is a great, well written article. It stands out amongst some of the articles on the website because of this – too many are poorly written or are doctrinaire and lacking in creative imagination. They often ignore the reality of today’s political situation. I especially like the solution in the article that Norway’s method could be used to tackled extremism. Islamaphobia has been deliberately fomented by very powerful groups interested in maintianing public support for our foreign policy. Check out the two reports by the centre for american progress called ‘Fear Inc’. That picture tells you all you need to know. You say islamophobia is on the rise in Scotland. Can you clarify what evidence there is for this statement? Why is it certain ethnic groups can settle in host countries with very little fuss? They conform to the norms of that society and they usually, eventually, prosper after working hard. I’m thinking of Chinese, Koreans and Vietnamese. Others find it much more difficult to adapt. Why is that? There is a school of thought which naively assumes, or wants to assume, that everyone is the same. that every individual is special and wants the same things and has the same goals, no matter what their race or culture. It just isn’t true. Exaggerating and talking-up Islamophobia is one of these. 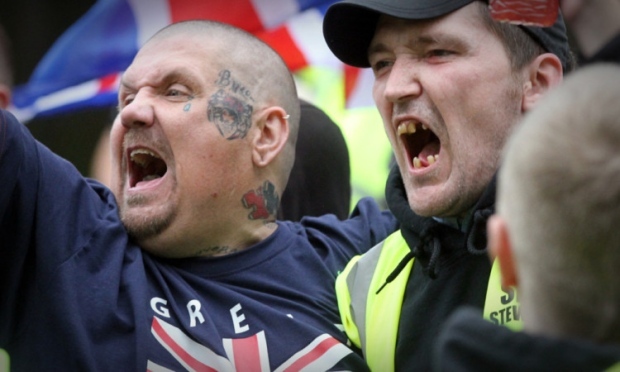 They talk up the rise of the ‘far right’ when they are, as most, an irrelevance who People have fear when they see all these atrocities night after night in places as diverse as Baghdad, Damascus, Benghazi, Sana’a and Maiduguri. It isn’t all the Americans’ fault. It isn’t all the Israelis’ fault. The vile Islamist death cults are spreading alarmingly. Their crimes have been unprecedented. They behead anyone who is not a Sunni muslim: other muslims, foreigners, women, children, anyone from other religions or ethnic groups. At the same time US influence is on the retreat. They have withdrawn from Afghanistan and Iraq and Kerry and Obama are trying to use their power in a diplomatic way. All this far left obsession with hatred of America is passe, it is old hat. And while some may blame the rise of political Islam as being caused by western interference in the region (which I accept led, largely, to the chaos in Iraq) it hasn’t been uniform. Our interest in Yemen has always been minimal in recent years and the Assads in Syria were always implacably anti-West. I know exactly what you mean! The English in particular are the worst expats in the world. Wont learn the language wont eat the local cuisine wont even drink the local water. Treat everybody else like Johnny foreigner. At best patronising at worse outright hostile. The white settlers from hell. Your use of the term ‘the English’ before you go onto stereotype all English people could be interpreted as offensive. You wouldn’t preface sweeping generalisations, based on cultural stereotypes, with ‘the Muslims’ or ‘the gays’, etc. Would you? Indeed it could but if I substituted Muslim in place of English then I have no doubt people like yourself would be less offended or not offended at all. I live in Aberdeenshire and we have a large number of English immigrants due to the Oil industry. At first and I’m talking about the 70’s it is true when they came here being bit sneery and condescending especially about not understanding the Doric but now they are well integrated and have made a huge contribution to our society. A lot of SNP branch’s have English members who are active in furthering Scottish independence. There will always be the ones who will remain little Englanders and be vocal but they in my opinion a minority. Their greatest contribution to Scotland is the fact that they anglophiled it. Almost took away our own distinct culture while doing so. Now apparently Scotland and England don’t exist at all because we are all distinctly British and live in the country of the UK of GB. Only the version of the UK of GB we’re supposed to believe in is nothing more than a Greater version of England. Ask anybody outside of the UK to describe the British and inevitably they will describe an English person the English culture and relate everything to London. The same thing happened to the Native Americans. They are no longer Sioux or Comanche or Apache or Arapaho they are all Native Americans. You try hanging on to your doric for as long as you can because in reality its on its way out. Hell, they might moan a bit about the weather and the spiders and the poisonous jellyfish at the beach but it is only moans. They generally adapt to life in similar, English-speaking countries like Australia and Canada…at least they don’t blow up their hosts. Yes they do. They have a history of blowing up their hosts. Read it. As the likes of Boris Johnson repeatedly jokes to his tory chums ( as a justification for inequality): there is a minority of society that is below average intelligence, possibly as large as 25% of the population. Ironically we know that Boris himself is of a lower intelligence as evidenced by his political convictions ( as right wing sympathizers are generally less intelligent). Among the lower classes, specifically the precarious underclass on the fringes of the global economy, there is a deep resentment & sense of powerlessness that is then channeled into some form of blame culture. We see these representatives in fascist-neo nazi organizations such as BNP, EDL, the various loyalist groups & even the Orange Order. This blame culture variously interchanges the scapegoat presently being kicked from jews, catholics, single-mothers, workshy spongers or muslims. The interchange to whatever minority to blame is largely determined by the fear-mongering propaganda of the corporate right wing media- the belligerent footsoldiers of these fascist organizations are particularly susceptible to the coercive ciphers inherent in the mass cultures dominant ideology ( due in most part to an impoverished critical capacity). Living in Britain it sometimes feels like we’re living through the 1000 year reign of the Third Reich: “This is a 1000 year old empire of an industrial caste system governed by a stream of never ending dynasty” ( Adorno- The Schema of Mass Culture). Do you have any data for your statement that ‘right wing sympathizers are generally less intelligent’. I recall the evolutionary psychologist Steven Pinker pointing to studies which suggested that people who were illiberal – racist, sexist, homophobic, scored poorly on IQ tests. Studies you will of course not be able to put your hand on anytime soon. Its no secret or stretch to reality to know that extremist groups attract more than their fair share of the braindead and nutjobs. That photo you see above is a perfect illustration of what they actually look like when they are indulging in their favourite pastime of pig ignorance. I was referring to mainstream right wing thought, as opposed to ‘extremist’ groups. On a personal level, many of the people I know who are on the right, or centre right, – e.g. they dislike the state, support low taxes, are anti-public sector, etc, as much as I disagree with them, I don’t detect any noticeable difference of intelligence between them and some of the people I know on the left. That said, some of my friends on the right do have rather small heads…. hardly definitive. But then it only backs up MY opinion on the matter. Frank I can’t really go on personal experience as I don’t socialize or indeed know anyone of a right wing persuasion- we must move in entirely different circles. Well, to paraphrase the late Christopher Hitchens, it’s good to have two sets of friends. Having thought about it though, many of the people I know, who I say are on the right, probably wouldn’t classify themselves as such. They don’t do ideology and there views, to them anyway, are just plain common sense. Whilst we get excited at the prospect of social change, they find it rather terrifying. I think it all depends on your relationship with the state. It’s interesting as well how people who are on the right can be thoroughly decent, as much as I disagree with them. The left does not have a monopoly on values or morals. But try telling that to some on the left who always assume that there opponents must be wicked, or incorrigible, or have some sort of ulterior motive. I’m disturbed by some of the comments about this article which seem to me to partially confirm the articles’ premise. A short answer to those asking for evidence of an increase in anti-Moslem views can be found in the social attitudes survey published NatCen in 2014 which detailed the increase in self-reported racism from 2001. It showed that racist prejudice and discrimination had dropped from the 80s and 90s in Scotland but began to rise back to the levels of the 70s between 2001 and 2014. 25% of Scots surveyed self-reported as being racist in the survey. They cited immigration and the September 11th attacks most often as justification. I want to take issue in particular with the “they bring it on themselves” and “others integrated ok without problems” type comments. In The Forgotten Kindertransportees: The Scottish Experience, Frances Williams argued that Italian immigrants not only faced oppression based on their nationality but also based on their religion, predominantly catholic. This included vicious anti-Italian riots as well as discrimination and prejudice against other foreign nationals with a catholic faith. In 1939, the head of the Board of Deputies of British Jews commented that anti-Semitism was as prevalent in Scotland as England. In 1938 The Scotsman wrote editorials against the Jewish “invasion” of Scotland and the anti-Jewish feeling generated contributed to many Jewish refugees in Scotland rejecting “Scottish” identity. A default anti-Semitic/anti-Catholic position in Scotland led to wide scale anti-alien positions taken against Poles, Austrians, Germans and Eastern Europeans. In The Atlantic Ocean: Essays on Britain and America, Andrew O’Hagan argues against the myth of a Scottish welcome to refugees and immigrants. He details racial antagonism to Lithuanians and Italians by working class Scots, motivated by a belief that they were here to undermine wages and steal jobs. Sound familiar? There should be no great leap of the imagination necessary to see that discrimination in Scotland has simply shifted emphasis from Catholics and Jews to Moslems. It suits those who are ultimately in power to see ordinary people divided so that they can rule more effectively in their own favour. Anti-Moslem discrimination simply continues the historical line of discrimination in Scotland for decades. From FGM, to treatment of women, to terrorism Reza Aslan demonstrates that stereotypical views held on Islam (repeated in posts above) are often misplaced. I’d suggest that those stating “what Islam is” use the actions of minority groups to justify an inherent Islamaphobia. I’ve travelled widely in Turkey, Iran and other “Moslem” countries: I simply do not recognise the characterisation of Moslems made by some commentators above. Not exactly free democratic countries, are they? Throughout the Muslim/Arab world (remembering that many countries are Muslim but not Arab – Malaysia, Indonesia, Bangladesh etc) almost every country is repressive and has an appalling human rights record. Tunisia, Jordan and Oman are the least bad whilst Syria, Iraq, Iran and Saudi are the worst. Which partially explains why so many of their citizens want to come to Europe for a better, more peaceful and more prosperous life. Greece may be in dire straits but it’s a helluva lot better than Syria. Repressive relative to who? We are the most monitored spied on society on the planet. CCTV, Online, Mobile phone coverage, Landline phone coverage. Any transaction you wish to make has you giving over your personal details as standard. You have no privacy at all and you probably don’t even realise it. Ok, Mike, it is time for you to go and live in one of those repressive countries. It is total nonsense to even compare life here with its minor inconveniences to life in Yemen, Saudi, Syria, Iraq, Libya, Somalia, the theocracy of Iran etc etc where you either live in constant fear of government-sponsored repression as in Assad’s Syria or even Egypt, or whether you live in fear of religious fanatics/terrorists such as in Raqqa or Mosul. We enjoy a free press and we can say what we like and it is nothing short of pathetic to pretend that we are really hard done by – we aren’t. Which is why so many Muslims are coming to Europe and are risking their lives to do so. They want, what we’ve got. Evidence that Islamophobia is on rise in Scotland, can be seen from report from Scottish government which is called “EXPERIENCES OF MUSLIMS LIVING IN SCOTLAND” so Fuad Alakbarov is absolutely right. A state run as despotically and criminally as the UK of GB will always need an outside bogeyman to divert attention away from its own appalling and despicable domestic agendas. For decades we had the Eastern hordes with their Iron and Bamboo curtains. Countries whos only real crime in the eyes of Western Governments was to deprive Corporate interests of massive markets and profits. now we have Islam. Their crime is to have access to massive reserves of Natural resources much needed and desired by the West as well as the always much needed markets corporations need to make their obscene profits. Its Neo Liberalism which is the route of all the problems on Earth not religion. The hunger of greed that can never be fed to contentment. Mike, you are out of date. The USA is almost entirely self-sufficient in energy. It doesn’t need the oli and gas of the Middle east countries. They now send most of their oil to Japan, China and India. Greed isn’t about being self sufficiency its about being mentally ill to a point where no amount of sustenance fills it. Fuad Alakbarov is spot on about Islamophobia. Yesterday Humza Yousaf was yesterday “bombarded” with anti-Muslim abuse just minutes after discussing Islamophobia on live radio. Is Islamophobia not stirred up by the main stream media so when a incident occurs they can shout read all about it? We are poorly served by #msm which promotes divide and rule on behalf of the ruling elite. Indeed we in Scotland noticed that level of MSM stirring and poor service to partiality during the Indy ref campaign. It is not confined to Islam it is anything the UK state opposes. Although I live in London, I am Scottish (from Dumfries and Glasgow). If Scots are becoming anti-Islamic, this must be due to the bias in most Scottish and English press. Islam is like Christianity and Judaism, it has extremests who use religion as a weapon and indeed, as belief systems, religion can induce revengful behaviour toward those who seem alien. Anti-semitism is probably on the increase due to Israel’s treatment of the mostly Muslim Palestinians. By contrast, In Britain we accept the Muslim community as part of our country just as we accept the Jews, the Catholics, the Wee Frees, the Buddhists and so on. It is only if we can think of trying to understand each other that we can continue to live together in relative peace. James Cormack did you really say free press,you have got to be joking surely you meant free to print what you are told. Eh John, what are you reading just now? Is Bella Caledonia not free? Try looking for an example of this in the Middle East. much weaker by the time of the next referendum/election, as the virtual media gets more powerful year after year. Does anyone still believe 19 muslims with box cutters all directed from a cave in Afghanistan did 9/11 ? A third building WTC 7 came down, no airplanes hit that. Hmm…. So who did it, then – the fairies? James my simple soul, no my child the fairies did not do it. Cui Bono, Who Benedits from 9/11 ? The New American Foundation came out with a document before 9/11 written by neo con zionists Paul Wolfowitz and Richard Pearle ” We need a new Pearl Harbor to propel American hegemony into the 21st century.” You can see results, the rearranging of the Middle East over the last 14 years. We should be very careful not to conflate criticism of Islam and anti-muslimism. One is valid political stance and the other is simple bigotry. ‘Islam is a set of unreconstructed beliefs that if followed would see us back in the dark ages’ is not in any way bigoted. However the statement ‘ Muslims are from the dark ages ‘ is. Let’s not go down the same road where ‘ anti-semite’ is used to denounce anyone critical of the Israeli Goverment’s policies and to stifle meaningful debate. …and that leads us into to the realm of “fact” and “opinion”. a) That “Islam” is a homogeneous monolith (which it is not). Ever heard of Sufiism rather than Wahhabiism? b) That the “dark ages” were dark, in Islamic terms, they certainly were not! One need only to have visited the Ali Ibn Hamzeh Shrine in Shiraz, read the poetry of Hafez and Saadi, study al-Khwarizimi, who pioneered the study of algebra. “Dark ages” Islam gave us the standard medical text in Europe for over five hundred years (Ibn Sina), a system of trained doctors with free hospitals, belief in a spherical rather than flat earth and the study of eclipses, the rotation of the planets, and calculation of the circumference of the earth to within a few thousand feet. All in your “dark ages”. So, Paul, I would say that your assertion is inherently bigoted! It takes a Euro-centric, monolithic view of Islam and the dark ages which leaves much to be desired.